3743 "up the back" at Prestwick - EGPK, Scotland. CF-WJB of Gateway Aviation, at Edmonton, Alberta. CF-WJB-X on display at Hamilton - CYHM, Ontario. • 3743 Royal Canadian Air Force. Delivered 20-Dec-1956. Initially assigned to 115 Air Transport Unit, which was a UN support unit based at El Arish, Egypt. Incident: Six miles south of Abu Radis, Egypt. 19-Feb-1957. Force landed without incident on a road after engine failure. Repaired and continued flight next day. Noted at Prestwick 03-Jan-1961 - Airlifted back to Canada. June 1961. Attached after overhaul to 111 Communications & Rescue Flight at Winnipeg, MB. Incident. 10th August 1961. Aircraft suffered engine failure and force landed on Great Bear Lake. It required an engine change, which took several days to accomplish. Full story shown below. Oct-1962. To 6 Repair Depot at Trenton, ON for storage. Oct-1964 Aircraft was moved to storage at Saskatoon, SK and put up for disposal by the Crown Assets Disposal Corporation. Note: Refurbished and civilianised by Field Aviation (Québec) at Montréal's Dorval Airport. Completed Jul-1965. • CF-WJB North Air Ltd., St. John’s NL. Regd Jul-1965 and leased back to Gander Aviation Ltd. Based at Gander Lake, NL. Incident: Charlottetown, PEI. 30-Jul-1965. During delivery flight, whilst at anchor and on floats a yacht was blown by strong wind into the aircraft damaging the wings and tail, which was repaired and the delivery flight continued. • CF-WJB Gateway Aviation Ltd., Edmonton, AB. Regd. 10th Dec-1965. • CF-WJB Eclipse Consultants Ltd., Oshawa, ON. Regd 03-Jan-1975. • CF-WJB Labrador Airways Ltd., Goose Bay, NL. Regd 14- Mar-1975. Incident: One hundred miles south east of Goose Bay Winter 1975. Aircraft suffered engine failure and made a forced landing on a lake. A cylinder was changed but as the Otter was taxying for take-off, one of the floats detached due to corrosion of the strut and a wing went into the water. This required a new wing, a major undertaking. Before this could be arranged, freeze-up occurred and the aircraft had to spend the winter of 1975 / 1976 literally stuck out frozen lake. The following spring, a new right wing was flown in by DC-3 and the Otter repaired on site. Incidents Two further small incidents followed and are recorded in the history below. • CF-WJB Airtech Canada Ltd., Peterborough, ON. Regd 18th July 1979. • CF-WJB-X. Airtech Canada Ltd., Peterborough, ON. Regn for test flying. The first aircraft to be fitted with a Polish Pezetel 3S engine. Certification on 11-Jun-1980. • CF-WJB Cargair Ltd., St. Michel- des-Saints, QC., and also based Schefferville, QC. Regd 07-May-1981. • CF-WJB Les Ailes de l'Esperance (Québec) Inc. Regd 17th Jun-1982. • OB-M-1253 Les Ailes de l'Esperance / Alas de Esperensa (Wings of Hope), Satipo, Peru. Circa early 1982. • OB-1253 At a later date. Note: Re engined with a Pezetel PZL ASZ-621R engine of one thousand horse power at Satipo during 1988. Note Aircraft put into indoor storage at Satipo in 1993. Note: Purchased by Frank Kubisewski, of Kuby's Aircraft, Kenora, ON., Nov-2000. See story of recovery to Canada, below. Note: Refurbished and EDO 8100 floats, a Baron STOL kit and a three-bladed Hamilton Standard propeller added. • C-GIGZ 1417885 Ontario Inc., (Kenora Air Service), Kenora, ON. Regd 30-April-2001 (Note a Frank Kubisewski company aka Kuby's). Note: Put up for sale Mar-2002, asking price US$800,000. Total time. 11,300 hours. Mods. Upgross to 9,000 pounds, new windshield and bubble windows, new paint scheme, complete new interior. However, no takers at the time. • C-GIGZ Kenora Air Service Ltd., Kenora ON. 13-Aug-2002. Remained stored. • N435B Kirk M. Thomas. Regd 26-Mar-2004. Airworthiness date: 01-Jun-2004. Category – Standard / Normal. • N435B Single Otter Leasing LLC., Ketchikan, AK. Regd 14-Feb-2006. • N435B Leased to Pro-Mech, Ketchikan, AK. Dates unknown. Note: Re-engined with a Vazar turbine motor. Date unknown. Incident Ten miles off shore of Cedar Key, FL. 17-May-2013. Aircraft was on a reposition flight from Key West, FL to Ketchikan, AK. Pilot stated while cruising at 8500 feet they heard a thump and within 5 seconds the engine had seized. A normal water landing was made approximately 10 miles off shore, aircraft was towed to Cedar Key by rescue boat. Pilot stated that inspection revealed exhaust can cracked, engine case ruptured, power turbine blades missing, prop governor beta cam blown out, suspect no. 1 or 2 bearing failure. Aircraft damage limited to cowling and engine components. 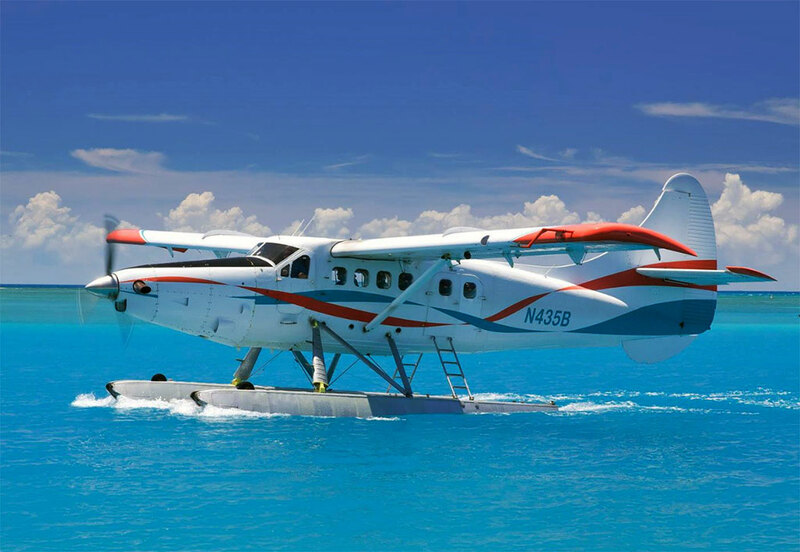 • N435B Operated by Key West Seaplane Adventures (An Associate Company of Pro-Mech), Key West, FL. Otter 183 was delivered to the RCAF on 20th December 1956 with serial 3743. It was one of three Otters delivered to the RCAF that day, the other two being 3744 and 3745. They replaced three Otters (3693, 3695 and 3699) which the RCAF had transferred to the US Navy in 1955 and which had been urgently required by the Navy for work in the Antarctic. These three Otters 3743, 3744 and 3745, were prepared at Downsview for United Nations duties with the RCAF. 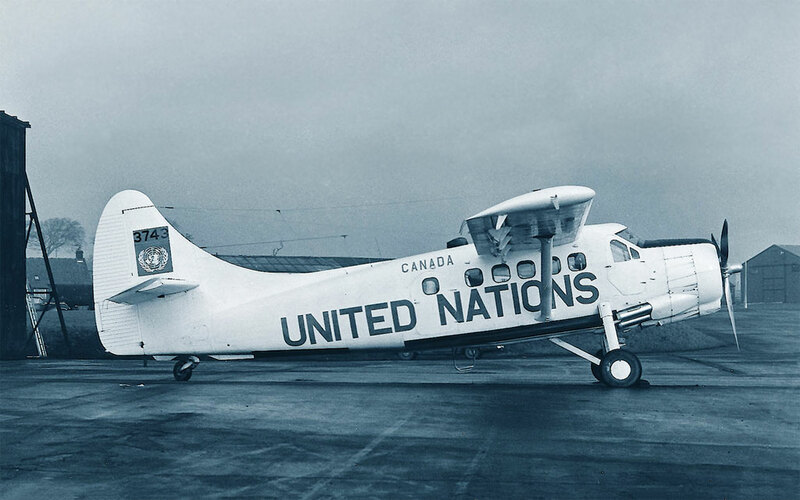 They were delivered in natural metal colour scheme, with large 'United Nations' fuselage titles, the serial on the tail, but devoid of any RCAF markings. Together with Otter 3675, they were assigned to 115 Air Transport Unit, which was a UN support unit to be based at El Arish, Egypt. The United Nations were supervising the withdrawal of British, French and Israeli forces from Egyptian territory in the aftermath of the Suez crisis. The three Otters were flown from Downsview to Halifax, Nova Scotia where they were joined by 3675 (33). The four Otters were loaded on board the Royal Canadian Navy aircraft carrier 'HMCS Magnificent' at Halifax, which sailed on 29th December 1956 and docked at Port Said, Egypt in mid-January 1957. On 13th January 1957 maintenance personnel started assembling the Otters and on 18th January 1957 they flew off the carrier to their base at El Arish. The Otters were to be used for transport, communications and general utility tasks, as well as for patrolling border areas. 3743 is mentioned often in the 115 ATU diary. On 19th February '57 it made a forced landing on a road six miles south of Abu Radis. It landed without mishap and after repairs to the engine flew on to Abu Sueir the following day. Other specific references to 3743 include a medevac flight from Cairo to Gaza on 31st August 1957, another medevac of a Bedouin person wounded in a mine accident from Sharm El Sheik, and a mission to Port Said on 26th March 1958. 3743 continued in service with 115 ATU until December 1960, when it was airlifted back to Canada. It was noted at Prestwick on 03 January 1961. After overhaul, to ensure that it was fully recovered from its arduous duty in the desert, 3743 was next assigned to 111 Communications & Rescue Flight at Winnipeg, which it joined in June 1961, adopting the unit's PW code. It was soon in action, and in early August 1961 set off for an inspection tour of the Yukon and Northwest Territories. Unfortunately, on 10th August it suffered engine failure and force landed on Great Bear Lake. It required an engine change, no easy task in such a remote spot. A few extracts from the 111 C&R Diary show the task to have been a lengthy and difficult one: “19th August 1961. Otter 3694 departed for Fort Franklin via Fort Smith and Norman Wells for support duties between Norman Wells and Fort Franklin for 3743's engine change. Sikorsky H-34 9630 also departed for Fort Franklin to provide air support for 3743”. Then on 21st August: “Dakota 668 flew to Norman Wells to airlift personnel and equipment from Norman Wells to Bennett Field in support of repair operations in progress on 3743”. At last, 3743 was repaired and on 28th August Otters 3694 and 3743 in company with the H-34 9630 were en route from Fort Franklin to Yellowknife when they were diverted to take part in 'SAR Herriman', a search for Cessna 180 CF-ICR overdue on a flight from Yellowknife to Coppermine and return. 3743 went unserviceable again and had to remain at Yellowknife, but 3694 took part in the search and the missing Cessna was eventually found. 3743 eventually made it back to base at Winnipeg after a lengthy sojourn in 'the boonies'. With 111 C&R Flight, 3743 served alongside Otters 3679 and 3694. On 6th August 1962 it departed from Winnipeg for another northern inspection tour. On 9th August it was diverted from that tour to assist in a search for a missing boat. The Otter was at Fort St. John when it was ordered to proceed to Inuvik, a transit time of 10 hours 20 minutes. It joined Otters CF-MPW of the RCMP and CF-JAO of Pacific Western on the search, and flew eight and a half hours of search time. The missing boat was eventually found by a Cessna 180 of Reindeer Air Services. 3743 continued in service with 111 C&R Flight at Winnipeg until the unit was disbanded later that year. On 1st October 1962 the unit's Otters left for storage with 6 Repair Depot at Trenton, Ontario. In October 1964 the Otter was moved to storage at Saskatoon, Saskatchewan and put up for disposal by the Crown Assets Disposal Corporation. In May 1965 the Otter was sold to Gander Aviation Ltd., and moved to Dunville, Ontario for collection by the buyer. Dunville was another RCAF storage facility. A ferry permit was issued for a flight from Dunville via Toronto to Montreal where the Otter was to be refurbished and civilianised by Field Aviation (Québec) at Montréal's Dorval Airport. Marks CF-WJB were allocated, the 'WJB' standing for William Bennett, the owner of Gander Aviation Ltd., this being his first Otter. On 23rd July 1965, when work on the aircraft was complete, a ferry permit was issued for a flight from Montréal-Dorval to St. Jovite, Quebec and the Otter was registered CF-WJB to North Air Ltd., St. John’s Newfoundland, this being an associated company of Gander Aviation Ltd, and the Otter was leased to Gander Aviation Ltd. On 30th July the delivery flight took place. Slight damage to the wings and tail took place at Charlottetown, PEI when a yacht was blown by the wind and collided with the Otter, which was on floats, but the damage was repaired and 'WJB delivered to Gander Aviation Ltd. For the summer of 1965 the Otter flew from Gander Lake. On 18th November 1965 the Otter was sold by North Air Ltd to Gateway Aviation Ltd., to whom it was registered on 10th December 1965. It moved to its new base at Edmonton and was to serve with Gateway Aviation for the next nine years. Most of its flying was in the Northwest Territories and for some of the time it was based at Fort Smith. During July 1967, floats were installed by Northwest Industries at Edmonton and also tanks for firefighting. In December 1974 a ferry permit was issued for a flight from Edmonton to Toronto and on 3rd January 1975 the Otter was registered to Eclipse Consultants Ltd., of Oshawa, Ontario, who had purchased 'WJB from Gateway Aviation. Eclipse Consultants traded in Otters and they soon sold it on. Its next owners were Labrador Airways Ltd based at Goose Bay, Labrador to whom CF-WJB was registered on 14th March 1975. In the early winter of that year, WJB suffered engine failure some one hundred miles south east of Goose Bay and made a forced landing on a lake. A cylinder was changed but as the Otter was taxying for take-off, one of the floats detached due to corrosion of the strut and a wing went into the water. This required a new wing, a major undertaking. Before this could be arranged, freeze-up occurred and WJB had to spend the winter of 1975 / 1976 literally stuck out in the sticks, its wing frozen into the lake. The following spring, a new right wing was flown in by DC-3 and the Otter repaired on site. The floats were removed and replaced by wheel-skis. A ferry permit was requested on 13th May 1976 for a flight from “Byrne's Lake” (so called after the pilot who had the misfortune to be flying the Otter when the float had fallen off) to Goose Bay. On 18th July 1976 a ferry permit was issued for a flight from Goose to St. Jean, Québec for the installation of new floats, after which WJB re-entered service with Labrador Airways. The following year, on 23rd March 1977, on take-off from Lodge Bay en route to Port Hope, WJB struck a telephone wire, resulting in some damage to the vertical fin, which was repaired. Two years later, another incident is recorded. The ski-equipped Otter was flying from St. Anthony to Mary's Harbour, Newfoundland on 26th April 1979. Wind direction dictated an approach over high ground and power lines. The pilot's attention was diverted by these obstacles and he allowed his airspeed to fall off. This, combined with the reduced effect of wind below the hills and the late application of power, resulted in a hard landing and substantial damage to the Otter. This was the pilot's first flight in six months and he stated he did not have the feel of the aircraft while landing with a full load in the confined area. After temporary repairs on site, a ferry permit was issued from Mary's Harbour via Goose Bay to Montréal where permanent repairs were carried out. WJB did not serve much longer with Labrador Airways. It was sold to Airtech Canada Ltd., and left Goose Bay on 18th July 1979 en route to Peterborough, Ontario, its new owner's base. Airtech were working on a plan to re-engine the Otter with a Polish Pezetel 3S engine, and WJB became the first Otter to have this engine installed. It was re-registered CF-WJB-X for the test flying. Canadian certification for the engine fitted to the Otter was received on 11th June 1980. 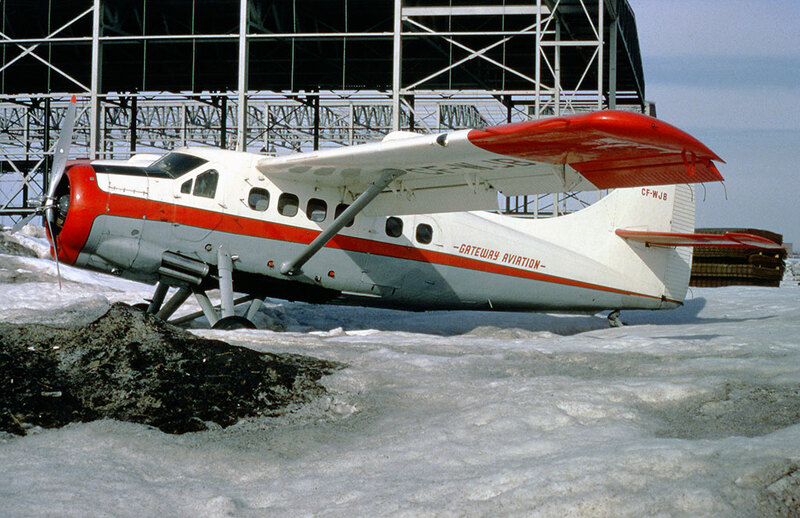 The Otter was sold on 7th May 1981 to Cargair Ltee and for the summer of 1981 WJB flew from their base at St. Michel- des-Saints, Québec, moving to Schefferville for the autumn caribou hunting season. After winter storage, the Otter was sold to Les Ailes de l'Esperance (Québec) Inc., to whom it was registered on 17th June 1982. The Otter was donated to Alas de Esperensa del Peru Inc., registered OB-M-1253 and set off for the long delivery flight from Peterborough to Peru. Les Ailes de l'Esperance/Alas de Esperensa (Wings of Hope) is a Canadian non-profit charity which provides free transportation and communications to isolated jungle villages. Founded in 1965 it emphasises self-help and trains the natives to become pilots, radio operators and managers. It established a main base at Satipo in Peru and another at Iquitos and from these bases distributed food, mail, pharmaceutical products and emergency services to 62 landing strips in the Peruvian jungle, serving some of the world's most isolated and impoverished people. Saving lives was almost a daily occurrence, when severely injured or sick patients could be conveyed to hospital in a matter of hours, compared with the only other means of transport - a stretcher carried over jungle trails, a journey which could take weeks. The Otter proved most suitable for this operation, its STOL characteristics enabling it to operate from even the shortest strips, some of them only 700-foot-long, and which could be covered in mud during the rainy season. At some stage the 'M' was dropped and the Otter re-registered OB-1253. It flew 600 hours in its first year of operation in Peru, transporting more than 400 tonnes of diverse goods essential to the well-being of more than 250,000 native people served by Wings of Hope. The Otter was based at Satipo, alongside the rest of the Wings of Hope fleet, Beaver OB-1275 (which also had a PZL engine), a Cessna 206 Stationair and an Evangel 4500, quite a rare machine. Originally the Otter was flown in its blue and white Cargair colour scheme with 'Alas de Esperenza' titles, but was later re-painted with an all-white fuselage and black cheat-line edged in red. The PZL 3S engine did not work too well with the Otter, and all eight Otters converted to use this engine had the engines removed, either reverting to the Pratt & Whitney R-1340, or else being converted to take the PZL ASZ-621R engine of one thousand horse power, which did prove a success with the Otter. OB-1253 was fitted with the one thousand horse power engine at Satipo during 1988, but had only flown eight and half hours with the new engine when the operation ran into difficulty. In a way it was a victim of its own success, as it could now perform so well carrying heavy loads, that other local Peruvian operators complained to the Government. As well as flying in food and medical supplies to the native villages and providing a medevac service, the Otter flew out their produce, coffee, maize, cacao etc. to the markets in the larger towns. It did all this for free, whereas the other operators were flying for gain. Their complaints to the government were successful and Wings of Hope were no longer permitted to fly the Otter, which was put into storage at Satipo, after a last flight in 1993. For the next seven years the Otter remained in store at Satipo, fortunately parked in a hangar. In November 2000 it was purchased by Frank Kubisewski, of Kuby's Aircraft, Kenora, Ontario, no stranger to bush aircraft, having rebuilt numerous Otters, Beavers and Norsemen. With an associate he travelled to Lima, Peru where he arranged two flatbed trucks and rented a car for the 14-hour drive across the mountains to Satipo. After great efforts, the Otter was dismantled and loaded onto the trucks. With the load secured, the two truck convoy left Satipo and again endured the 125-mile road trip across the Cordillera Mountains, braving the steep canyons, narrow roads and sickness caused by the 15,800-foot altitude. They continued to the seaport of Callao, where the Otter was transferred into a forty-foot shipping container and set sail for Vancouver via Panama. It was then transported by CP rail to Winnipeg and then by truck to Kenora, where it arrived at Kuby's Yard on 26th January 2001. A team of AMEs and apprentices immediately began dismantling, inspecting and overhauling. The Otter was put on EDO 8100 floats, a Baron STOL kit added and a three-bladed Hamilton Standard propeller from a DC-3 installed, which delivered more torque and less vibration. On 30th April 2001 the Otter was registered C-GIGZ to 1417885 Ontario Inc., of Kenora, a Frank Kuby company. It made its first flight after restoration on 8th October 2001. It became the eighth Otter rebuilt by Kuby's Aircraft. C-GIGZ performed four flights before being taken out of the water for the winter. One of the flights was a photo shoot over Lake of the Woods at Kenora, the resulting photographs showing the Otter in all its glory. In March 2002 the Otter was advertised for sale, with impressive credentials. It had 11,300 hours on the airframe, zero hours since major overhaul and complete restoration, EDO 8100 floats, upgross to 9,000 pounds, Hamilton Standard DC-3 hydromatic three-bladed propeller, new windshield and bubble windows, new paint scheme, complete new interior, asking price US$800,000. 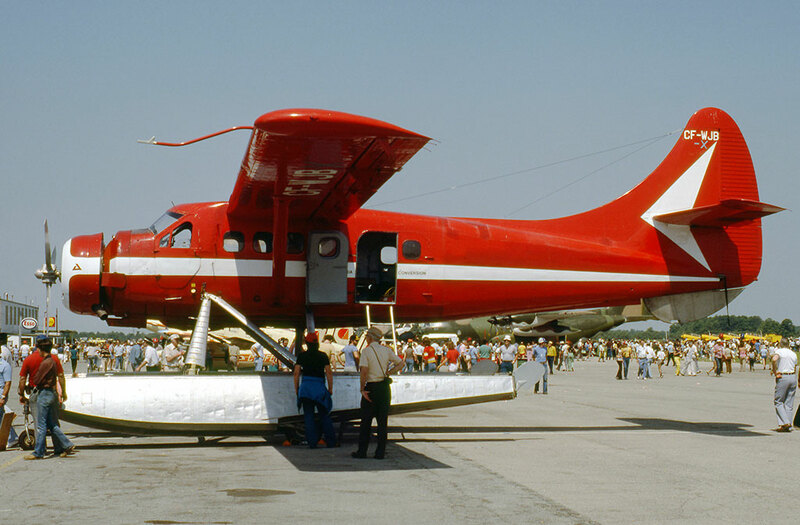 A sale however did not materialise at that time and on 13th August 2002 the Otter was registered to Kenora Air Service Ltd, Frank Kuby's airline operation, which flew Otter CF-CBA (230). Otter C-GIGZ remained parked at Kenora awaiting a purchaser. The Otter was eventually sold, to Kirk M. Thomas of Ketchikan, Alaska and was registered to him on 26th March 2004 as N435B. 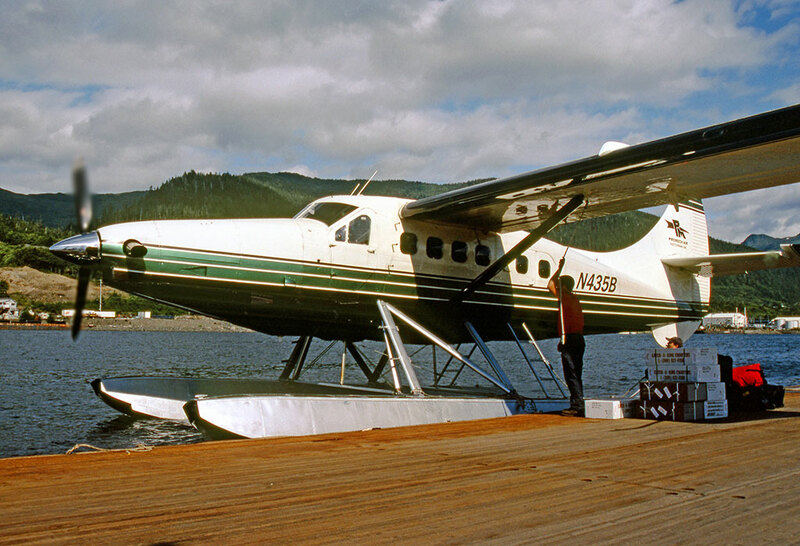 Mr. Thomas had been the owner of Tyee Airlines when it flew Otters based out of Ketchikan during the early 1980s. N435B made the long flight from Kenora to Ketchikan, where it arrived on a rainy Thursday, 22nd April 2004. As the local newspaper reported: “The thousand horse power Otter with its notable upper intake and eleven-foot three-inch blade propeller makes a big visual statement compared to the now common turbine Otters we have all become accustomed to seeing on the Ketchikan waterfront. Kirk Thomas has leased the Otter to Pro Mech Air to shore up the fleet in time for the busy tourist season”. Mr. Thomas describes the epic ferry flight: “I needed to get the Otter to Ketchikan so it would be ready to go on line in early May, so I could not wait for the lake it was on at Kenora to thaw out. I flew it off the frozen lake and went directly from Kenora to International Falls, Minnesota where we cleared customs and went through the import process. All the lakes in the area were frozen so we landed on a river that runs through town. We found a good tie up spot near the pulp mill where we spent the night and prepared for a long cross country flight. We did not know what the fuel burn was, so we carried 50 gallons in jugs for en-route refueling”. “I had always pictured the Missouri River as being a large river, but it is very small, with virtually nowhere to land with more than a few hundred feet between the curves in the river. If I had an option I would never have landed there. As it was, we were in bad need of fuel and had no choice. Getting in was not a problem as I was able to land upstream and upwind. Getting out was a little more difficult. For a number of reasons, I had to go downstream and downwind on take-off. We had an extremely difficult time getting turned downstream in the current but once we did, I found out why everyone is raving about the PZL conversion. I put all one thousand horse power to the test and we came off the very short stretch of river with room to spare. My brother-in-law had his eyes covered during the take-off, steep turns and climb out but it really was not that bad. From Poplar we went west across Montana, found another open spot to transfer more fuel and spent the night in Coeur d'Alene, Idaho. From there we only had another 250 miles on to Kenmore Air Harbor in Seattle”. “We left the Otter there for a couple of weeks and had all new radios installed, and then my son and I went back to Seattle to collect it. We left Seattle at 9am with clear blue skies, stopped in Campbell River on Vancouver Island for customs and fuel and then made it non-stop to Ketchikan. We started getting a low cloud cover about 150 miles south of Prince Rupert, BC, and then the last 75 miles was very nasty weather. We landed in Ketchikan with half mile visibility and 50 knot winds at the airport. The waterfront winds were only about 30 knots and the water was workable, so we had a successful end to a very fun trip. In all, about two thousand miles and fifteen hours of flight time. I have always loved the Otter and really think this conversion is superior to anything done so far. It is not as pretty as the turbine but it is an impressive aircraft”. After this epic ferry flight, N435B entered service with Pro Mech Air, on lease from Kirk Thomas, flying alongside the company's turbine Otters.